Individuals and families in Brooklyn and Uniondale, NY are turning to the 2018 Jaguar F-PACE—not just because of its stylish exterior and confident SUV performance but also for its premium interior design and features. See why Edmunds calls it “elegant” and “spacious” with this interior guide, and then check it out at Heritage Jaguar of Freeport. This luxury SUV also has seating for up to five adults across two rows of seats, as well as 33.5 cubic feet of storage space behind the rear seats. The rear seats also fold down, revealing more room for luggage and long items when it’s needed. Interior Mood Lighting – Projecting soft pools of light in ten different colors, the interior mood lighting system lets you choose the atmosphere inside the cabin. Panoramic Roof – The power panoramic sunroof opens up across the first and second rows, providing a comfortable breeze, sunlight, and a view of the stars for everyone in the cabin. 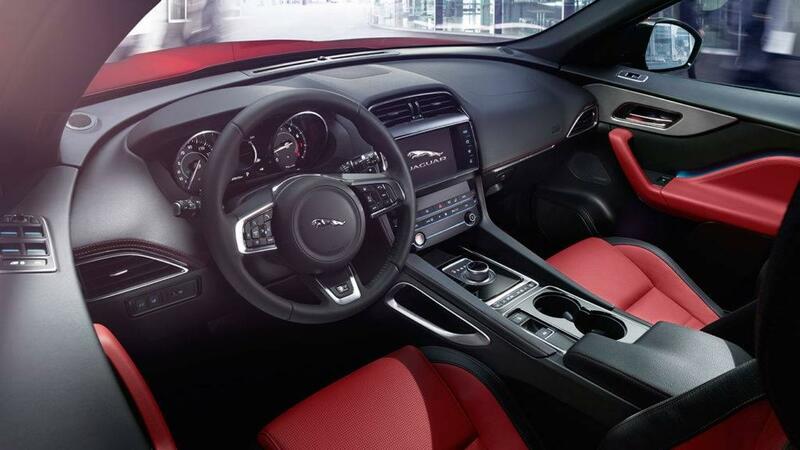 Leather Seating – The Jaguar F-PACE is offered with Brogue Perforated Taurus leather upholstery and Jet/Red Perforated Taurus leather upholstery. Choose the one that suits your personality!